Every year, we acknowledge the outstanding contributions of physicians around our province through the Doctors of BC Awards. This year, the ceremony took place at our Annual General Meeting event in Vancouver June 3rd. 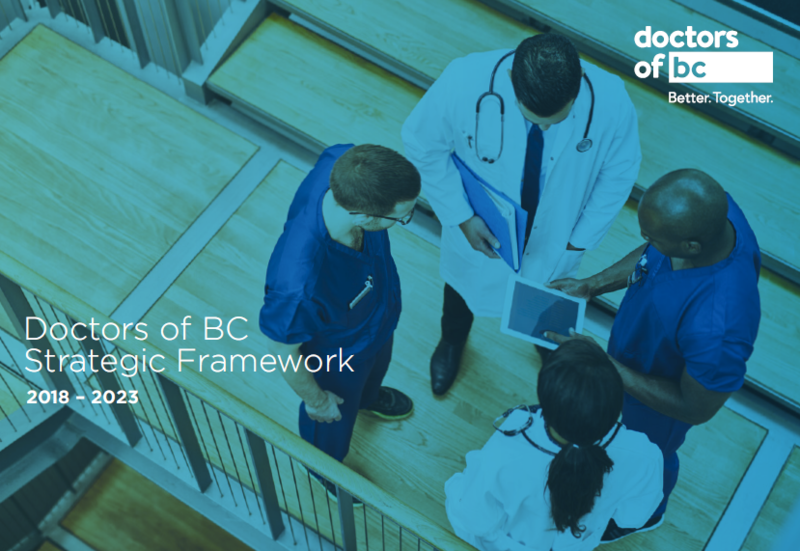 Doctors of BC congratulates all the recipients who have made and continue to make a meaningful difference for our patients, for the profession and for health care system. Dr Dan MacCarthy received the Dr Don Rix award, which recognizes lifetime achievements and exemplary physician leadership that serves as an inspiration to the medical profession. A longtime Executive Director at Doctors of BC/BCMA, Dr MacCarthy played a key leadership role in the creation and development of the GP Services Committee (GPSC) and its programs – including the establishment of incentive payments for chronic/complex care, and the creation of Divisions of Family Practice and the Practice Support Program. Through his work, Dr MacCarthy helped set a foundation to help to increase morale among GPs and to bring about an increase in medical school graduates opting for family practice. Three physicians were awarded the Doctors of BC Silver Medal of Service, which goes to those who made outstanding contributions to medicine and/or improving the welfare of British Columbians. Dr Geoff Appleton continues to be a champion of rural medicine after more than two decades of working with the Doctors of BC/BCMA. While practicing in Terrace for over 40 years, he served as Chair of the Rural Physicians Committee, Chair of the Northern Isolation Committee and member of the Provincial Coordinating Committee on Rural and Remote Health Services, among others. Although he is now retired from practice, Dr Appleton is still very much involved in patient care, rural issues, and making a difference. Dr Elizabeth Lund is the program coordinator of the Selkirk College Rural Pre-Medicine Program. Now in its third year, the unique program provides extra training for rural students interested in pursuing medical careers.The program’s goal is to help rural and remote communities meet the challenges of finding physicians and other health professionals who are committed to and passionate about careers in health care in small communities. Dr Lund’s role reflects her passion for helping students in rural and aboriginal communities who are interested in studying medicine. Dr Jack Taunton is a leader in the development of Sports Medicine. He has been at the forefront of clinical and exercise medicine research focusing on overuse injuries, injury prevention, concussion in sport, and cardiac disease in athletes. In 1977, he co-founded the country’s first cardiac rehab unit that applied exercise to help individuals recover from heart attacks. He received the Queen’s Diamond Medal Jubilee and was inducted into the BC Sports Hall of Fame. Dr Taunton continues to run his clinical practice out of the Allan McGavin Sports Medicine Centre. The Dr David M Bachop Awards are given to BC doctors who have made an extraordinary contribution in the field of organized medicine and/or community service. Dr Trina Larsen Soles focused on medicine as a career because it combined her keen interest in science with her belief in one’s duty to give back to society by helping others – something she has been doing for her patients and the profession for 30 years. In addition to her family practice in Golden, BC Dr Larsen has long been involved with Doctors of BC serving in a number of positions including Chair of the Council on Health Policy and Economics, Chair of the General Assembly, Vice Chair of the Board, and District Board Delegate. She is currently President. Dr Bakul Dalal, is this year’s recipient of the Dr Cam Coady Award, which commemorates Dr Coady’s love of medicine and ensures that his vision to achieve excellence in health care continues to be fostered. Dr Dalal has distinguished himself through his commitment to diagnostic Hematopathology, flow cytometry, resident teaching, and mentorship of research projects. He has published more than 100 papers and abstracts in peer-reviewed journals published, presented at international conferences, and has an active interest in clinical guidelines for the South Asian population. His long commitment to international medicine is remarkable and noteworthy, having been awarded the "Pride of India Award" in 2012. Dr Dalal has a long record of involvement with Doctors of BC, where he has served co-chair of the Guidelines and Protocol Advisory Committee. The Inter-Cultural Online Health Network (iCON) is recognized for its community-driven health promotion initiative that helps patients and caregivers across Chinese, South Asian, and Aboriginal communities in BC to prevent and manage chronic disease. Dr Kendall HO accepted the award on behalf of the iCON team. Drs Elizabeth Zubek, Len Hatlelid, Matthew Chow, Melodie Prem-Smith and Ursula Luitingh are recognized for their work in bringing together a wide range of community partners to provide supports and services for youth aged 8 to 24 who experience mild to moderate forms of mental health and substance use issues. The effort resulted in the creation of the Youth Wellness Centre in Maple Ridge, which provides timely access to psychiatric services, youth advocates and family physicians. Ms Daphne Lu is a third year medical student in UBC’s Medical Program. She has displayed exemplary leadership with the Medical Undergraduate Society, especially in her current role as President. A most notable contribution is Ms Lu’s creation and implementation of the first ever MUS Strategic Plan which recognizes the crucial role that fostering student engagement in early medical training plays in developing physician leaders of tomorrow, and which will be used to guide the activities of student leadership over the next several years. Dr Jesse Kancir is a first year resident in Public Health and Preventative Medicine at UBC. He has been involved with a wide range of medical advocacy organizations. His involvement with the Canadian Federation of Medical Students, especially in his role as President, he championed thoughtful and sustainable health policies that benefit institutions and the patients they serve. Dr Kancir has made lasting contributions to the health care sector provincially and nationally, working as Policy Advisor to the Federal Minister of Health in 2016 in which he served on a number of major portfolios including Bill C-14 – Medical Assistance in Dying. In 2015, the Medical Post named him one of the “20 doctors to watch” and cited him as being medicine’s “Leader of Tomorrow”.